A a well-kept mane can make the difference between first and second place in a horse show. On the flip side, a damaged or unattractive mane can take away from your horse's appearance and make him appear poorly groomed. If your horse is damaging his mane by rubbing out his hair, you will need to take steps to prevent damage from occurring. Chances are high that you care a whole lot more about the condition of your horse's mane than your horse does. Your horse is not rubbing out his mane because he cares about the mane. He is rubbing because he itches and, since he does not have fingers, rubbing the itchy area against a hard object is the only method he has of scratching it. Rubbing can break hairs, pull out hairs and lead to frizzy and bald patches within your horse's mane. Mane rubbing is unattractive but usually not painful. The most effective way to stop your horse from rubbing out his mane is to figure out what is making him itch and treat the problem. Fungus, mites, lice, mange, dirt and bacteria all can cause a horse to feel itchy. Make sure to keep your horse's mane well groomed and clean at all times. Have your veterinarian check your horse thoroughly for skin problems. If your horse has a skin problem, such as a fungus, you may be able to use a special shampoo or prescription medication to treat the condition and stop the itch. If your horse isn't itching, he likely won't be rubbing his mane out on the nearest fence post. 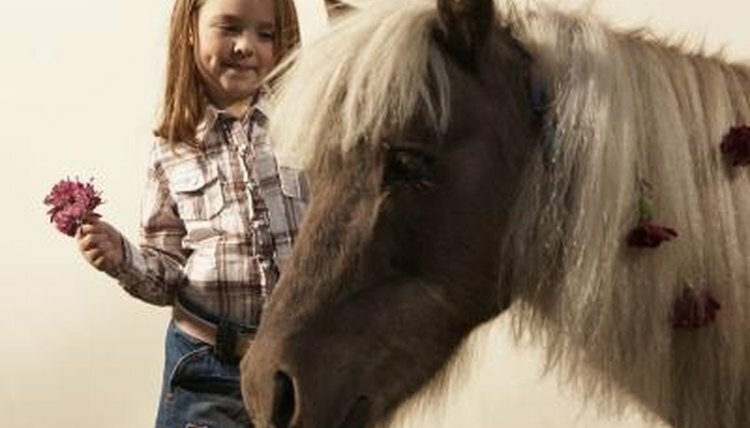 Horses tend to rub show braids out of their manes after a couple of days, especially if the braids are tight. Avoid braiding your horse unless it is absolutely necessary and don't leave the braids in for weeks at a time. America's Horse Daily, a publication of the American Quarter Horse Association, also recommends putting a satin-lined hood over your horse's head and neck to prevent mane rubbing. The hood can be used both at home and at shows. If your horse is determined to rub his mane on something, you may have to take some preventative measures to prevent him from rubbing out the whole mane. Removing posts, tubs or hay rings that your horse is using to rub against from his environment can make rubbing less likely to occur. You also can wrap hard-edged surfaces in padding to minimize the abrasive action that occurs when your horse tries to rub.